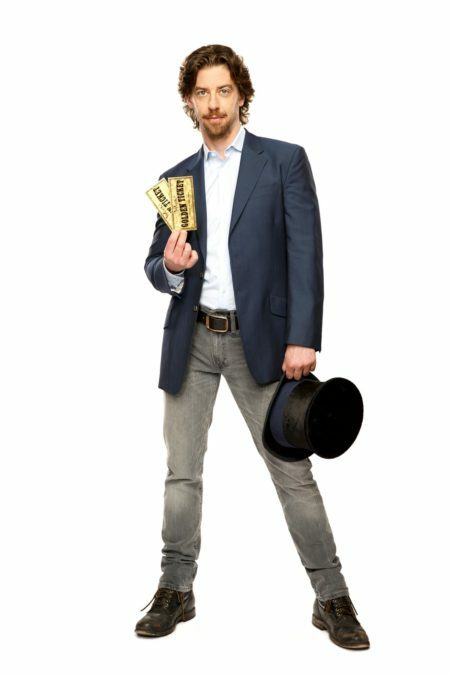 Two-time Tony winner Christian Borle is in gobstopping demand! The Something Rotten! star, who is going on to headline the Broadway revival of Falsettos this fall, will then take on the role of Willy Wonka in Charlie and the Chocolate Factory in the spring. Directed by Jack O’Brien and choreographed by Joshua Bergasse, the previously announced reworked transfer of London's hit tuner is set to begin previews in March 2017 at the Lunt-Fontanne Theatre, the current home of Finding Neverland. This means that Borle could conceivably be up against himself for Best Actor in a Musical at the 2017 Tony Awards. Borle took home a Tony Award in 2015 for his performance as a leather-clad Will Shakespeare in Something Rotten!. He also won in 2012 for Peter and the Starcatcher. His additional credits include Legally Blonde, Mary Poppins and Spamalot on Broadway and NBC’s Smash, The Sound of Music Live! and Peter Pan Live! on screen. Featuring a book by David Greig with music by Marc Shaiman and lyrics by Shaiman and Scott Wittman, the musical is based on Roald Dahl’s 1964 children’s book, Charlie and the Chocolate Factory. Willy Wonka, world famous inventor of the Everlasting Gobstopper, has just made an astonishing announcement. His marvelous—and mysterious—factory is opening its gates…to a lucky few. That includes young Charlie Bucket, whose life definitely needs sweetening. He and four other golden ticket winners will embark on a mesmerizing, life- changing journey through Wonka’s world of pure imagination. Get ready for chocolate waterfalls, exquisitely nutty squirrels and the great glass elevator, all to be revealed by Wonka's army of curious Oompa-Loompas. Dahl's book was first adapted to the big screen in 1971 under the title Willy Wonka & the Chocolate Factory, starring Gene Wilder. In 2005, Tim Burton directed a remake using the novel's original title, with Johnny Depp playing Wonka. Further casting will be announced at a later date. The production will feature scenic and costume design by Mark Thompson, lighting design by Japhy Weideman, puppet design by Basil Twist and orchestrations by Doug Besterman. The West End staging officially opened at London’s Theatre Royal Drury Lane on July 25, 2013, starring Tony and Olivier winner Douglas Hodge as Willy Wonka and helmed by Sam Mendes.